Patagonia and Danner have partnered up to build two of the most durable and highest-performing wading boots on the planet – the Foot Tractor Wading Boot and the River Salt Wading Boot. After extensive collaboration between designers, ambassadors and anglers from around the world, and countless hours of in-the-water research, Patagonia has combined their fly-fishing experience with Danner’s legendary quality and craftsmanship to create a wading boot beyond all others. Patagonia believes that the love of wild fish and wild rivers lasts for a lifetime, so they’ve channeled their our own obsessions into building products that last just as long. The best wading boots need to be ultra-comfortable and supportive for long days in the water. They should grip subsurface terrain, muddy trails and the occasional cross-stream log. They must drain quickly and avoid holding excess water. And on top of being tough as nails, they need to last a lifetime. 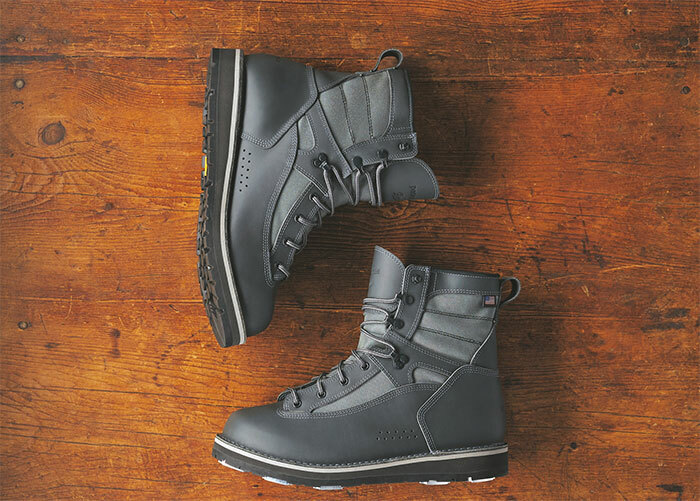 Meticulously designed in partnership with Danner Boots and built by hand in Portland, Oregon, these two new wading boots are the best the company has ever made – and the last ones that you’ll ever need to buy. Providing heavy-duty support and protection for the most demanding wading, the Foot Tractors are the most durable, highest-performing wading boots possible; aluminum bar, Vibram® Idrogrip, and felt sole options allow anglers to choose the most effective traction for their specific needs.